Learn how to say 'hello' in over 50 languages with this fun and colourful bingo game! Discover an array of global greetings, from the familiar to the unusual, and test your linguistic abilities as you play the fast-moving and beautifully illustrated Hello World Bingo. Each player takes a game card featuring 16 different world 'hellos'. If the caller calls a 'hello' from their card, they place a token over it until all 16 squares are covered. The first to complete their card wins the game. Each greeting is accompanied by a phonetic spelling to help you to say it aloud, together with information about which language it is and where in the world it is spoken. 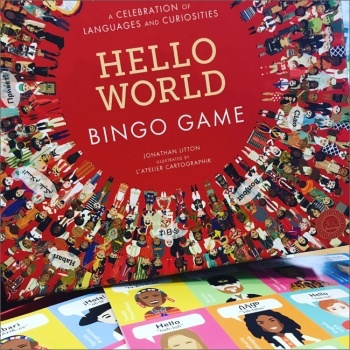 Hello World Bingo is aimed at ages 4+. Box contains: Instruction leaflet, 1 master board, 8 game cards, 64 'hello' cards, 130 round counters.